UFO researchers and writers today are tantalized by the increasing reports of alien abduction, photographs of alien beings, UFO crashes, possible debris, and implant removals. In a way we have become spoiled; expecting the sensational. This desire for ultimate proof has caused us to overlook the seemingly mundane, everyday reports of night lights, which were at one time sensational in their own right. With the ever growing technology of our era, pictures and video are often times called into question because of the ease of manipulation and creation afforded computer graphics experts. Called into question, that is, by those who are waiting in the wings to debunk any and all visible proof of UFOs as suspect of being hoaxed. This is especially true in cases with one or two photos taken by one witness. This has always been a pitfall to researchers who scratch and claw for authentication of a particular photograph or video. There are, however, those cases which have multiple photographs of the same object, taken by many witnesses. This type of case carries the heaviest weight to those who remain on neutral ground. One of the best of these is the Phoenix, Arizona lights case of 1997. Accompanied by many photographs and videos, this fantastic event is still discussed and analyzed today. Evidence points to March 13, 1997 as the onset of this extremely compelling account of various and sundry phenomenal lights which moved over the state of Arizona. 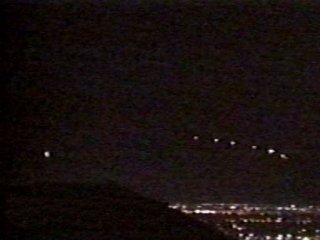 These lights, though referred to as the "Phoenix Lights," were actually witnessed in at least five other cities. Phoenix has the distinction as the first Arizona city to report the unknown light sources, which were initially spotted over Superstition Mountains, east of the city, at about 7:30 PM. The first reports indicated an object of six points of light, immediately followed by a report of eight connected lights, with a separate ninth, which moved in unison with the eight. The formation was seen again over the Gila River just before 10:00 PM. 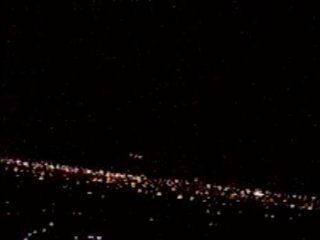 In a matter of minutes, the enormous, lighted structure had made its way over the southern part of the city of Phoenix. At this time, literally thousands of people witnessed the object or objects. It was at this time, that the first photographs and videos were taken. The final sightings of the night were in Rainbow Valley. Witnesses there reported a distinct "V" formation. This sighting occurred at about 2:00 AM on March 14. It is important to note that there are various descriptions of the lights from the Nevada border throughout Arizona. Some witnesses described a very clear "V" shape, while others said that the lights were circular or cresent shaped. It is only common in night light cases for these differences to come to light. Many factors can attribute to these sundry descriptions. One specific object can be seen from different angles, the angle of the object may only reflect part of its light system, depending on atmospheric or weather conditions, or the very way a witness looks at the object can make this difference. It is very possible that two witnesses can see the same object at the same time, and give two completely different accounts. This fact has been proven in scientific studies of eye witnesses accounts in crime cases. Another possibility in the case in point is that there may have been several different objects of different shapes and sizes. In my own research into this case over the years, I have come to the personal conclusion that the main object over Arizona was of a circular shape, and this is corroborated by the various still and video film taken. There were other shapes observed, but it appears that the "mother-ship" was circular. 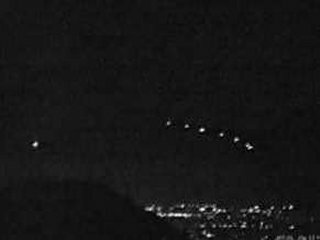 Though the huge lighted formation seemed to move in a tauntingly slow speed over Arizona, it was reported that strange lights had sped from the Henderson-Las Vegas, Nevada area toward Arizona, and seemed to slow down as it entered the Arizona area. Initial reports described anywhere from 5-7 points of light, and ultimately 8 with a trailing ninth. The enormous object was extremely low, and mountainous area could be seen behind the craft in pictures, therefore giving photographic experts scale to approximate the elevation from the ground, and the distance from the camera. This would enable an estimate of the craft being a whopping one mile or more in length! The color of its lights were described as "blue-white," to "yellow-white," to "amber." Again, these differences of description do not necessitate there being more than one object. During the crafts fast moving period, it was estimated to be moving at Mach 2-3. As it slowed down as if posing to be filmed, the speed dropped to an estimated 10-15 MPH. At one point over Sky Harbor, it reportedly hovered for several minutes.The object was also reported to change shapes, speeds, and colors, as it made its way across the skies of Arizona. Between 9:00 and 9:30 PM on the 13th, one extraordinary description was made by a family in Mesa. They said that an enormous craft with a distinctive structure flew over their area. They described a triangle-shaped object with lights at three corners, and another larger light in its center. Amazingly, they could clearly see panels on the craft which were in a grid pattern. There were also, about this same time, several reports of two round objects which seemed to detach from the larger "V" shaped object, only to later rejoin the mother-ship. One witness described the "V" shaped mother-ship dividing itself into two separate craft as it moved toward the city of Tucson. Another dramatic description of the mother-ship was made by a group of real estate agents who had subdivided property over the north part of Phoenix. They would also get a close-up view of the gigantic disc. They estimated the craft to be a staggering two miles wide as it flew at a low altitude near Phoenix. They could see dozens of bright lights along the leading edges, and also a row of windows with "silhouettes of people." It also seems highly probably that for some reason, the giant craft turned off its lights, as observers could see only the windows with what appeared to be people shadowed in the glow of the inside. Another family got a brightly lit view of the unknown object, and described its color as "flat blue-black, like the color of a shotgun barrel." Among the most reliable witnesses of the craft's movements that first night were two airplane pilots, one retired from an airline, and another from Vietnam, who was also a U. S. Marshall. Though seeing the object at different times and places, both men described a craft of "immense size," measuring up to a mile long. The Marshall could also see the city lights of Phoenix reflecting from the bottom of the massive object, while it "blocked out the stars." One of the pilots also videotaped the UFO, but had the tape confiscated in a "men in black" encounter. In a completely separate incident, a group of witnesses had reported a "huge discoid" craft which was "larger than Sun Devil Stadium at Arizona State University." This object was hovering just above tree tops at the west end of Sky Harbor runway between 2:00 and 3:00 AM about two weeks prior to March 13. It is almost inevitable that the United States Air Force would become involved in an event case of this magnitude, and the Phoenix lights mystery would be no exception. While driving down Interstate-I-17 from Camp Verde, a truck driver had been seeing two amber colored UFOs moving ahead of him southward for two whole hours. His destination was a materials plant near Luke Air Force Base. Upon arriving there, the two UFOs hovered nearby. While his truck was being loaded, the driver walked upon a pile of materials to get a better look at the two UFOs. He could make out two identical "toy, top-like amber orbs" with a white glow to them. A band of red lights pulsated on the craft as it hovered near the Luke AFB runway. Suddenly, two F-16s "blasted out of Luke with their afterburners on full." Soon, a third plane followed, and all three made a direct run toward the hovering UFOs. As the first two jets were about to reach the UFOs, the unknowns shot straight upward, and disappeared "in an instant." The two jets flew right through the exact spot the UFOs had previously occupied. A Luke ground crewman later confirmed to NUFORC that the driver's account was true. He also stated that upon returning to the base runway, one of the pilots had to be helped from his cockpit. He was visibly shaken from what had just happened. One of the more intriguing reports was submitted by a young man who claimed to be an Airman in the Air Force, stationed at Luke Air Force Base, located to the west of Phoenix in Litchfield Park. He telephoned the National UFO Reporting Center at 3:20 a.m. on Friday, some eight hours after the sightings on the previous night, and reported that two USAF F-15c fighters had been "scrambled" from Luke AFB, and had intercepted one of the objects. Although the presence of F-15's could never be confirmed, the airman provided detailed information which proved to be highly accurate, based on what investigators would reconstruct from witnesses over subsequent weeks and months. Two days after his first telephone call, the airman called to report that he had just been informed by his commander that he was being transferred to an assignment in Greenland. He has never been heard from again since that telephone call. 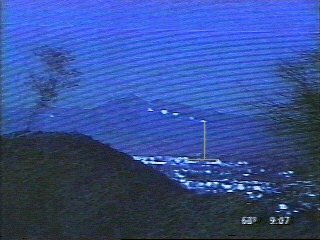 The Phoenix lights case is not without its controversy, much of which originated from the Air Force. In May of 1997, Luke AFB Public Affairs Office stated that Air Force personnel had investigated the so-called "UFOs," and had solved the case. They claimed that flares dropped from an A-10 "Warthog" had caused the numerous reports of night lights. This explanation is totally unfounded for several reasons. First of all, flares do not move in unison, fall toward the ground, and then fly back up into the air, and move across many miles without changing their relative positions. Secondly, many witnesses had made reports of the giant lights hours before the reported time of the launch of the flares.